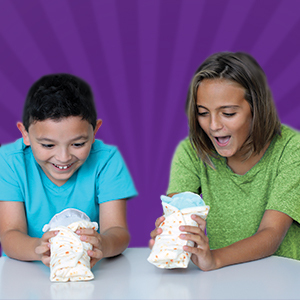 Discover all that's inside of a Cutetito burrito—unroll to reveal your new soft pet and everything about it! Who will you get? 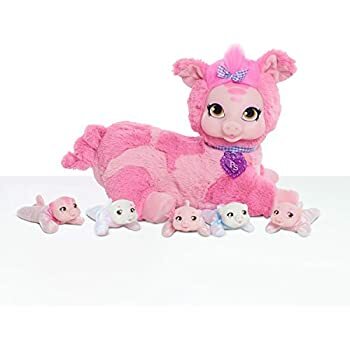 Cutetitos come in 12 possible collectible styles including a variety of puppitos, catitos, slothitos, pigitos, bunnitos, bearitos and monkitos! Each Cutetito has a personality "Hot Spot" that you discover when you unwrap it—it could be mild, medium, hot or super spicy! The pet collector card will tell you everything you need to know about your Cutetito—"Hot Spot", birthday, species, name and favorite quotito. 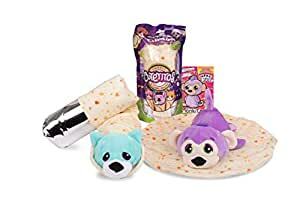 Packaged in a mystery bag, Cutetitos are 7.5-inch stuffed animals wrapped in a soft, plush burrito blanket that includes a pet collector card. Collect all 12! 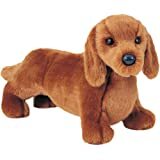 Cutetitos are adorable, surprise stuffed animals ready to be unrolled and discovered. Disguised in uniquely wrapped mystery packaging, Cutetitos are 7.5-inch assorted animals wrapped in soft, plush burrito blankets. 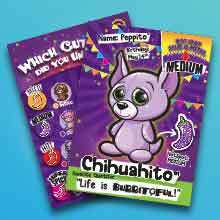 Each comes with a pet collector card that includes detailed information including its species, name, birthday and favorite quotito! And, to find out if each Cutetito's personality is mild, medium or hot, just check out its 'Hot Spot'! Discover a Catito, Bearito, Monkito, Piggito and more—some are ultra rare! Collect all 12! Based on the Viral Sensation! Everybody’s rollin’ their animals like a burrito, but nothing comes close to wrapping up a Cutetito! 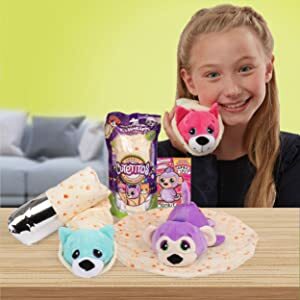 Based on the viral trend of pet owners wrapping their fur babies in blankets like a burrito, now kids of all ages can unroll burrito blankets with their very own furry friends. Unwrap to reveal which surprise animal is concealed inside! 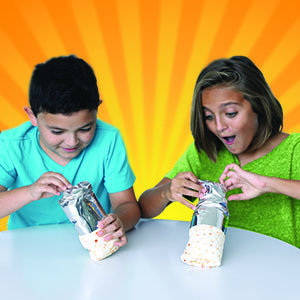 Discover all that's inside of a Cutetito burrito—unroll to reveal a new soft pet & everything about it! Will it be a Slothito, Puppito, Bunnito or even an ultra rare Cutetito? 12 styles in all! Each Cutetito has a personality 'Hot Spot' that can be discovered when unwrapped—it could be mild, medium, hot or super spicy! The Pet Collector Card tells everything about each Cutetito—species, name, 'Hot Spot' rating, birthday, and favorite quotito. Which one of the 12 Cutetitos is inside? 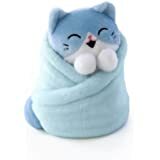 Within the burrito blanket, snuggled in foil, is a bundled cute surprise! Learn detailed information about your Cutetito on the product card like its species, name, birthday and favorite quotito! Some are even ultra rare! 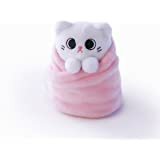 Wrap them up alone or together, tightly or loosely, in their burrito blankets, with the hook-and-loop fastener attached! 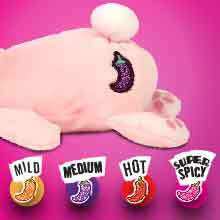 The fun is endless whether its 'Hot Spot' reveals a mild, medium, hot or super spicy personality! Whether each Cutetito is on the loose or nestled in its burrito blanket, there are so many ways to play! 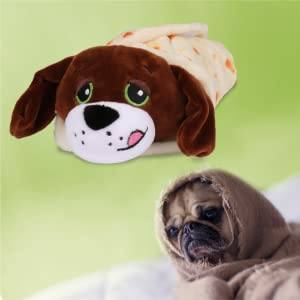 Turn the burrito blanket into a parachute, cape or even toss it like a pizza pie! 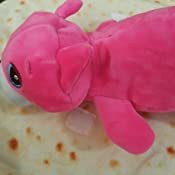 Cutetitos are a variety of adorable, stuffed animals wrapped and hidden in a burrito blanket ready to be unrolled and discovered! 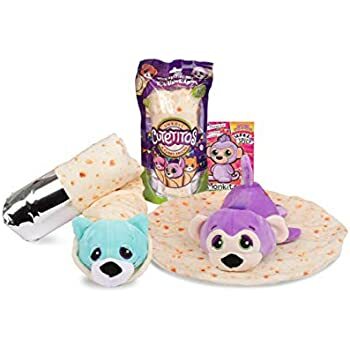 Based on the current trend of pet owners wrapping their pets in blankets like a burrito, now kids of all ages can collect Cutetitos and roll their own pet into a burrito! 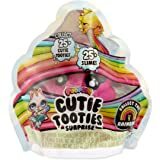 Cutetitos come uniquely wrapped in a large mystery bag building suspense of which Cutetito is inside, then unwrap to discover your new cutest pet & more! To find out if your Cutetito's personality is mild, medium or hot, just check out it's "hot spot"! From a slothito to a puppito, there are 12 different Cutetitos to collect. 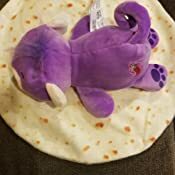 Each comes with a burrito blanket and pet collector card with additional information about your pet including its species, name, birthday and favorite quotito! 5.0 out of 5 starsSooo cute! These Cutetitos are soooooo adorable, and one of the best blind bags I have seen. The packaging is so creative! They look like real burritos that you would order at a restaurant. :) My kids just love them, and they are a decent sized toy. 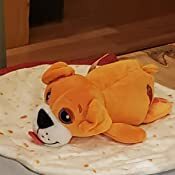 My son received one as a gift and unwrapped one of the rare plushies...a sweet orange puppy with little tongue sticking out. He loves to carry his new puppy around in his burrito blanket and have it "lick" people. 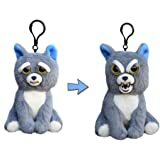 Of course my daughter wanted one as well, so I ordered from Amazon. 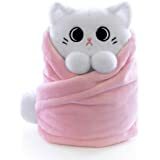 I was a little nervous because my daughter insisted she wanted to get a rare one too since that is what her brother got, but when her burrito arrived, she was very happy to have one of the common kitty cats. She didn't care that it wasn't a rare one and thought it was just so cute and soft. Both kids sleep with their burrito pets at night, and carry them around during the day. I myself love the fad of the blind bags. It is fun not really knowing what you are going to get, and every character is super sweet looking. The kids are asking for more for their birthdays. Our 4 year old daughter had to have this for her birthday after watching a commercial. It’s a cute idea but as soon as she opened it she got upset because she wanted the pink dog she saw on the commercial. It’s probably a genius idea because parents are pressured to buy more and more until their kids get the one they wanted. Obviously there is no guarantee you won’t get one you already have. My daughter did end up liking the one she got but I have a feeling she will continue to ask for more. 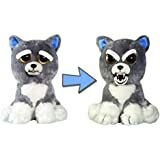 5.0 out of 5 starsBest Toy Ever! My daughter was so excited when she opened this on her birthday especially because she got an ultra-rare Cutetito. I will definitely purchase one for her this Christmas. 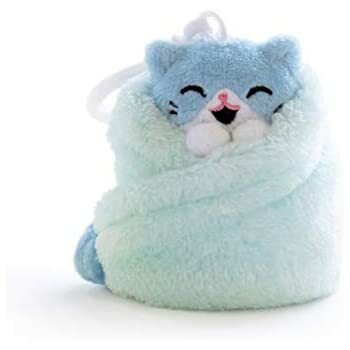 These toys are really cute. 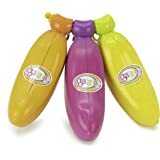 My 7 year old loves these - and I think I figured it out. 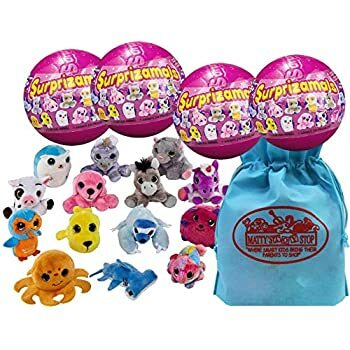 The mystery of not knowing is why hatchimals and these are so popular. It is wrapped as a little burrito and is soft and well played with. It was better construction than I was expecting. My wife hates it because the mystery of not knowing means you can't know if you are just getting a duplicate or not. Nothing special about it expect the cute concept. 5.0 out of 5 starsHow exciting, surprise inside of a tortilla, cute idea, love it! When I first saw the tv commercial for cutetitos, I couldn't wait to get one for each of my grandchildren. 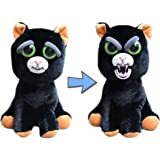 I have purchased 2 of these so far as Xmas gifts for my grandbabies, I can't wait to see their faces when they open them and see the surprise plush inside. 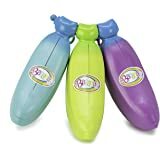 Extremely unique, I'm sure these will be a hit for children and families. (All ages) i may even get myself one. Like the idea that they are collectables. How fun!!! Each one having its own name, personality and degree of hottness. Im glad they are afordably collectables. Shipped in 2 days. Cute! My 10 year old LOVES them and I love them too haha. They are so soft and cute. They are fun to open and see what you get. 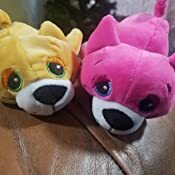 My aunt bought one on Amazon for my daughter and it was a super rare pink cat and we bought one a month later that was an orange cat. We are about to pick one up at target.